A new housing development in Croydon is taking shape ready for the next release of new homes taking place this month. Bellway is building a range of one, two and three-bedroom apartments at Ikon, the housebuilder’s new development on the former Lombard House site, off Purley Way. 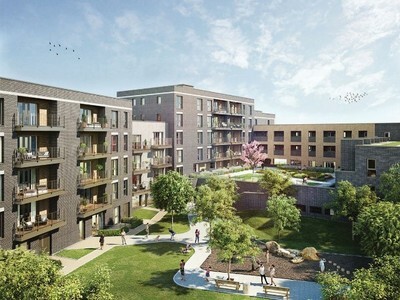 A selection of plots at the development have already been sold in advance – at Bellway’s Help to Buy Homebuyers Exhibition in London earlier this year – but the next release of homes will take place later this month[JULY] for home-hunters who’ve registered an interest. In the meantime, prospective purchasers can sign up online to receive the latest information about the launch. Head of Sales for Bellway South London, Natalie Hughes, said the new homes were continuing to generate a great deal of interest among buyers. She said: “There’s been a real buzz about the new homes we’re building at Ikon – and that’s no surprise because Croydon is such a fantastic up-and-coming location within easy reach of central London. July, and then we’ll be launching the development officially in September with the opening of a sales office on site. For more information about the homes at Ikon, go to bellway.co.uk.